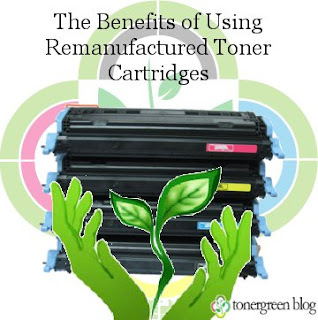 The Benefits of Using Remanufactured Toner Cartridges | TonerGreen - Eco-Friendly Toners from the U.S.
Remanufactured toner cartridges also called as "eco-friendly toner cartridges" have hit the market as alternative printer cartridges to replace OEM cartridges on those laser printers. These remanufactured toner cartridges are recycled OEM toner cartridges that are refurbished, cleaned and replaced any worn or defected parts before being refilled with high-quality toner powder and then are resale. Aside from being alternative cartridges, remanufactured toner cartridges also offer printer users a cost-saving alternative. Since remanufactured toner cartridges are recycled, they cost 40 to 50% less than OEM or branded cartridges. Because remanufactured toner cartridges use recycled parts in their manufacturing process, the production cost are lower than new printer cartridges. But even though remanufactured toner cartridges cost lower than branded cartridges, they're quality isn't much different from branded cartridges. They went under several quality-control tests to ensure they meet the standards and page-yield set by their OEM counterparts. They are built by professional technicians; quality strictly imposed every step of the remanufacturing process: which basically include inspection of raw materials, sorting of those toner cartridges that can still be turned into high-quality printer supplies and those who are not, disassembling, cleaning, digital filling of toner, sealing, assembling, post-testing, quality control and then packaging. Moreover, remanufactured toner cartridges doesn't just cut off your printing expenses, they also help contribute to the environment. Its environmental benefits include reduce waste on landfills, conserve natural resources and raw materials, and conserve energy. At TonerGreen.com, we offer an extensive selection of U.S. made remanufactured toner cartridges for famous printer brands like HP, Brother, Dell, Lexmark, Samsung, Sharp and Xerox.We take pride in the superior performance of our products compared to the average compatible or remanufactured cartridges found on the internet.We intend to help you make eco friendly choices for your home or office with the confidence that you are making a smart and responsible decision over cost reduction opportunities, waste elimination opportunities, reliability and compliance. Our remanufactured toner cartridges are 100% guaranteed to work on your laser printers and provide consistent, high-quality output.